Podgorica is the capital and largest city of Montenegro and the total urban area has a population of nearly 200,000 inhabitants, around a third of the total population of the country. It is located in the south of the country, inland but still a short distance from the beautiful coastline of Montenegro. It is the administrative, cultural and economic heart of the country, but still sees far less tourists than the coastal area. People have been living here for thousands of years and the oldest physical remains are from the late Stone Age, all visible in or close to Podgorica, although historical Cetinje remains of more importance. Podgorica has a typical Mediterranean climate with mild winters (when most of the rain falls) and hot and dry summers. The location inland in a valley means that summer temperatures can be very high, and despite the dry air it is sometimes unbearable with temperatures over 40 °C during the day common in July and August. In winter, frost is possible but it rarely gets really cold for a long time. Podgorica Airport (TGD), located at 11 kilometres south of the city, receives international flights, among which are those with the national airline Montenegro Airlines. Destinations include Bari, Belgrade, Frankfurt, Ljubljana, Paris, Rome, Skopje, Vienna and Zurich. A few other airlines provide direct flights as well to other cities like Budapest and Moscow. There is regular passenger train service from Subotica through Novi Sad and Belgrade, and even regular trains from Bar to Budapest running through Podgorica. Train tickets are cheap, but the quality of service is not always up to Western European standards. There are overnight trains with sleeping cars for around €25. Trains can be late but are a common means of transportation. Due to its location in central Montenegro, Podgorica is the hub of all main roads in the country. Road from the northern Montenegro and Serbia requires additional caution during the winter. Bus station (Glavne autobuska stanica), Trg Golootočkih žrtava (next to railway station). City centre is 10 minutes walk from there, but if you have any luggage - it's recommended that you either take a minibus (combi) or some of the taxis usually waiting at the station entrance. ), ☎ +382 20 620430. Cashdesk 05:00-24:00. serves number of domestic destinations, as well as those in neighbouring countries. Probably the best option to move around Podgorica are cheap and reliable taxi service. There are over 20 taxicab companies, that usually operate new air-conditioned European sedans. Taxi stands are virtually everywhere in the city, but they could also be reached by calling the dispatcher. - The fare is cca. €0.40 per kilometre, and usually no start fare is charged. Considering the size of Podgorica - no drive within the city should cost more than €3 or €4. - Taxi numbers: 19700 ALO Taxi, 19702 Royal Taxi, 19703 Boom Taxi, 19704 PG Taxi, 19705 Pink Taxi, 19706 DeLuxe Taxi, 19709 Orange Taxi, 19711 City Taxi, 19712 Exclusive Taxi, 19714 Red Line Taxi, 19723 Peugeot Taxi, 19800 Bel Taxi, 19708 Elite Taxi. Public transportation consists of buses, that are not very frequent, and maps of the lines could be hard to locate. Ticket price is between €0.80 per single ride, and can be purchased on board, usually directly from the driver. Podgorica is a medium-sized city of 180,000+ people. If your accommodation is near the city center, or the "Preko Morače" district - all points of interest could be visited on foot. Almost all fine restaurants in Podgorica are located either in the traditional city centre, the new business district around the Roman Square, or along the Sv. Petra Cetinjskog boulevard that connects the two. There are dozens of pizzerias through city, and most of the cafes serve pizza, pancakes, etc. Most popular fast food in Podgorica is the regional hamburger variant pleskavica. You can eat great hamburgers, as well as anything made on the barbecue (roštilj) in places all across town, but best known and most visited are "Voda u kršu", "Gurman", "Calimero", and "Kruna". Most loved amusement of Podgorica's residents is to sit in a cafe on a summer day and drink their espresso. There are dozens of cafes in pedestrian Njegoševa street in city centre, and many more scattered around the city center. Most of the new and trendy cafes are located around "Vectra" district in the new part of the city. Modern design and relaxed atmosphere of the cafes coupled with Podgorica's art of making espresso will make an interesting experience. Some of the well known cafes are :"Alpe bar", "Buddha bar", "Carine", "Greenwich", "Grand cafe", "Café, Café", "Switch cafe", "Soul II Soul"...and many more. Espresso costs from €0.50 to 1.50. Coke and other soft drinks and juices will cost from €1.00 up to 2.50. There is a number of clubs and bars to go out to in Podgorica. In the summer, there are many open-air bars and clubs. However, by law, open air bars must turn the music off at 01.00am, when the crowds move to the clubs located mostly in the basements in the city centre. The price of the accommodation varies, and is from €20 for a room in a motel on the outskirts of the city, up to over €100 in the premium hotels in the city centre. Wi-Fi points in bars and cafeterias are available to customers, and most hotels offer Wi-Fi connection in common areas for their guests. Some central tourist areas are also covered by wi-fi. Internetcafes are still widely available as well, mainly in larger cities and tourist places, less so in smaller rural towns and communities. The general emergency number is 112, but you can also contact police (122), fire (123) and ambulance (124) seperately. The international telephone code for the country is 382. MTEL CG, T-Mobile and Telenor Montenegro provide cell phone services in the country. All providers have national coverage, and provide advanced services. You can buy mobile phone sim cards already for € 1. As of 2011 you need to fill in short form and show ID or passport in order to activate prepaid number at local operator's store. It sure pays to get a local SIM card as data roaming services with you own cell phone are usually much higher. 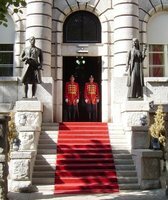 Montenegro Post provides quite reliable, affordable services, both domestic as well as international. Post offices generally keep long hours, from 7:00 or 8:00am till 8:00pm, 6 days a week, except Sundays. If you want to send a package, it might be better to use an international courier company like DHL, TNT, UPS or FedEx, as they are fast and competitively priced as well. We have a comprehensive list of accommodation in Podgorica searchable right here on Travellerspoint. You can use our map to quickly compare budget, mid-range or top of the range accommodation in Podgorica and areas nearby. This is version 15. Last edited at 3:17 on Aug 2, 17 by sleepBot. 19 articles link to this page.